If there's a series I've loved all of my life, it's the 1960's Batman TV series. The show strikes a rare balance of action/adventure for children, and biting satire and high camp for the adults. As a boy I lived through every on-screen comic book style "oooh!" and "nnng!" When I caught the show again in high school and college, I was constantly gobsmacked by the hippest humor, the most subversive rips on the establishment... Even when seconds were ticking away, there was always time for Batman to remind Robin that while the police would never ticket the Batmobile, it's still important to put a dime in the parking meter. Anyway I don't think that anyone will argue the brilliance of the show. Besides the heroes, the villians were perfectly cast to become icons in their roles (who can forget Caesar Romero's cackling performance as The Joker, complete with greasepaint over his trademark moustache?) The popular series has been in constant syndication since the original broadcasts in the late 60's. 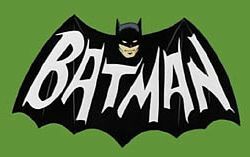 "Batman" was broadcast all year around in twice weekly installments, so even though the show only ran from 1966-68 there are enough episodes to make up what would be a five year run on TV today. Every few years some new project or other resparks "Batmania", the current cartoon and the "rebooted" film franchise are both enjoying tremendous success. You'd think that now would be the perfect time to release the whole TV run on DVD. 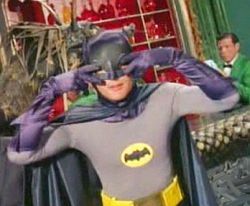 Except for the feature film based on the series from 1966, there has never been a release of 1960's Batman in either VHS or DVD. Stories swirl around about the series' rights being shared between several parties making a DVD release difficult, but then how is it that the show has run unabated on TV for forty years? Please, somebody release this great series... imagine how great the eye popping set designs could look in HD! Fun reunion film from 2005 "Return to the Batcave"